Last night the Golden Globes aired, but before the winners were announced and speeches were said, came the red carpet, and while I have to admit I think it's silly that reporters line up to only ask them who they're wearing, (because come on, when did being an actor equate to having a love of fashion? When we all know someone else probably picked the clothes and accessories they're wearing) especially since it takes up time for a question they'd probably prefer, and with the internet nowadays, the minute someone steps on the carpet there is already hundreds of people tweeting about what they're in. So in taking up no ones time but my own, here's my favourite looks from last night. Cinched waist, a sweetheart bardot neckline and a full skirt, Gina Rodriguez is what I imagine a real life Disney princes would look like in this Zac Posen ballgown. She kept makeup, hair and accessories simple, letting the dress speak for itself, but was in no way swallowed up by it. This is probably my favourite look of the whole night. 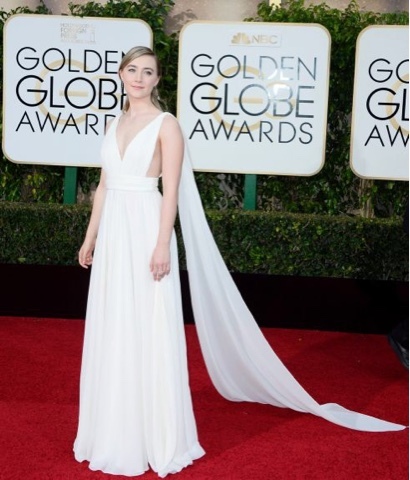 Saoirse Ronan wore a couture Ives Saint Laurent dress designed by Hedi Slimane. It looks like chiffon but is actually ivory silk draped, the dress all made by hand. It's been tethering on the line for a few years, but it seems capes are finally coming back in style, which I'm excited about, because how much does it create a Roman goddess feel? Joanne Froggartt wore a periwinkle blue Reem Acra. It had a deep plunge which was evened out with the soft material of the gown. Probably one of the reasons I like this dress so much is because it suits her so well. A lot of dresses I see, I like, but wouldn't put them on this list because I always think 'Oh, that would look so much nicer on her, and vise versa' it doesn't even have to be the shape or style of the dress, but the colour alone can make or break it, and this lavender/periwinkle is just perfect for Joanne Froggartt. I have to admit, before I saw this, I had no idea who this man was, but when looking at pictures of the Golden Globes this outfit immediately stood out. For decades the black and white tux have been a staple, or rule, for men's wardrobe, so much that if you were looking at men's outfits from the event it would be hard to tell if it were from the 73rd year or the 50th. 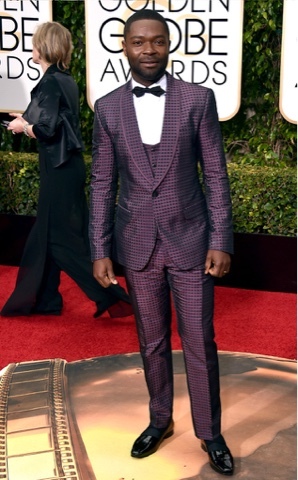 There's so little varient in tuxedos that an actor could probably wear the exact same one for the whole award season and no one would notice, which is why I'm giving major props to David Oyelowo for stepping out in this loud and colourful Dulce and Gabana tux. For some reason, I love and hate this dress, it took me a long time to decide it was on of my favourites. It's a beautiful dress, cutouts were a huge trend from 2015 that are graduating into 2016 (though thankfully they seem to be focusing on the waist/rib region instead of the hip bone high splits which leave way too much room for fashion disasters) and I love how the top is layered over, combined with said cutouts creating a streamlined silhouette. It's just the fact we've seen it all before, you can tell a dress is Dior, which certainly isn't a bad thing, but I'm never suprised when I see her on the red carpet, things look all too similar, it's a Dior over saturation. However, there was a reason why this is on my best dressed list and that is because of the combination of the choker and the dress. At first I thought the necklace was part of the dress, because it goes so well together, but it was only a little while after did I realise it was a separate, Chopard choker (sure we all have one or two of those lying around our house) teamed with the dress. So many people wore minimalist jewellery this year and I just want to applaud whoever decided to go the opposite route for this look. It really does make all the difference. I've come to a conclusion anything with a cinched high waist I will love. Well, not only is that the case here, but another reason I love this gown is the silver embroidary, looking like ripples of some sort head on but from the side you can see it is the petals of a flowers blooming. Rosie Huntington-Whiteley wore a couture Atelier Versace gown with sequin embellishments. Like Brie Larson, she went with the name and decided to wear the colour the event was named after, when would it be more appropriate? Plus, it goes great against the red. Another thing I really hope comes back for 2016: trains, big, long trains. It's no wonder why I loved Laverne Cox's white Elizabeth Kennedy gown. I loved how she picked up the colour with plum lips and green Lorraine Schwartz earrings, which were again picked up on the pattern on her clutch. jennifer lawrence's one looked amazing!! So many of your picks are so good! I love Rosie's dress - it looks amazing on her, and I think Zendaya may be one of my favorite girls to look to for beauty looks these days!